One of the many awesome things about the Dollhouse is that it gives us these great windows to decorate. Since I’m so used to living in apartments or single-story homes with porches that obscure windows and doors (great for keeping the house cool, not so great for decorating), having that row of upstairs windows is still kind of novel for me. And I knew without question that I wanted wreaths for the windows for Christmas. 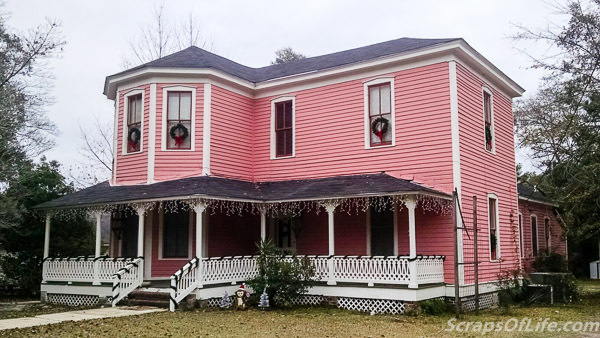 Don’t mind the bare center window–the upstairs tree will shine through it at night! The question was, how to hang them? There are plenty of instructions for double-hung windows that involve lowering the top sash, but ours are the old single-hung type. There’s always the “direct” route involving the porch roof and maybe a ladder besides, but I wasn’t keen on the danger element, there (and this was months before Todd and ladder disagreed and he ended up with plates in his wrist, no way we’d go that route now!). So what to do? 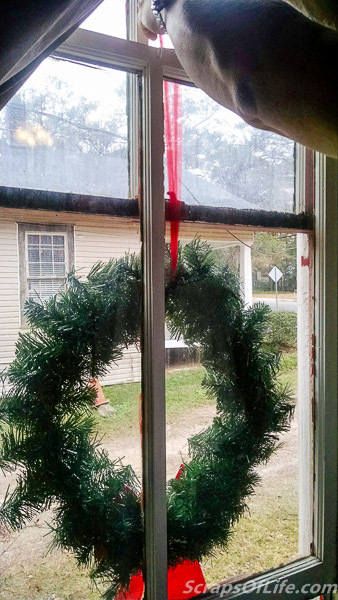 Necessity is the mother of invention, after all, so this is how we hung our Christmas wreaths on those upper windows (pictures from last year). If you’ve faced a similar quandary, allow me to solve that for you! You can tell this was taken in 2014, the hallway still has its wallpaper! So start out by fluffing out and decorating your wreaths as necessary. The fluffing is mandatory for most artificial wreaths as they’re quite squished and can look pretty anemic when first purchased. I chose to go with simple red bows and nothing else because it presents the highest contrast and is less likely to get damaged by the elements. Tie a fairly long loop of tulle or netting to the top of each wreath. While I suppose you could anchor the wreaths to the window latch, it didn’t sound like a good option long-term. 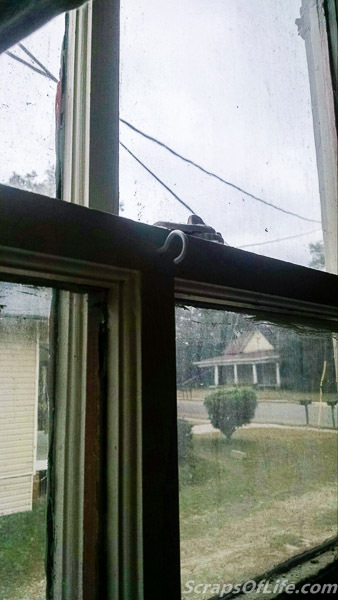 Cup hooks are cheap and it’s not going to compromise the window frame. 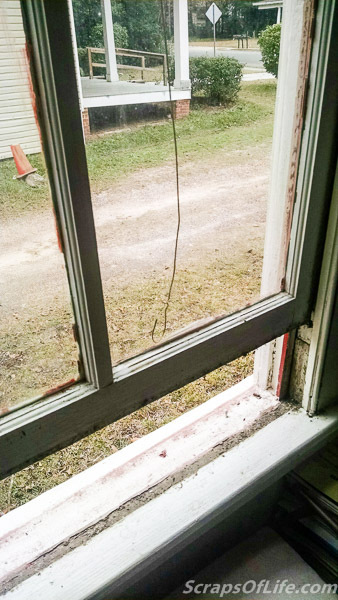 Screw a cup hook (hook facing down) to the center-top of the lower window sash, on the inside of the house. This will be your anchor. Straighten out the coat hanger except for the top hook. Now, open the window about 6-8 inches or so, just enough to let the wreath pass through when flat. (Oh, you’re going to need to remove the screens for this to work, too. Most of our upstairs windows don’t have screens, so it’s not really an issue for us.) Slip the coat hanger, hook-down, behind the lower window sash–it helps if your helper is tall–and between where the two sashesÂ pass. Hook the tulle onto the coat hanger and have your helper carefully pull the hook up and through the gap between the window panes while you guide the wreath safely through the open window gap. It’s worth noting that our windows are 70-some-odd inches high, making each half more than a yard tall. If your windows aren’t so lofty and you have reasonably long arms, you might be able to do this without a helper. And there you go! One safely hung wreath! Close the window, sandwiching the tulle between where the sashes overlap (the tulle compresses enough that there’s not a big gap for air to seep in or out), position the wreath roughly in the horizontal and vertical center of the lower sash, and wrap the tulle several times around the cup hook to secure it, finishing with a slip knot. Tadaa! You have now hung your exterior wreaths without risk of life or limb. You can’t see the wreaths, but you can see the lit Christmas tree upstairs. We’re looking forward to getting our tree this weekend and I’m sure the outdoor decorations will be coming out as well! We kept the unbent coat hanger in the closet with the rest of the decorations just so we wouldn’t have to hunt up another one! 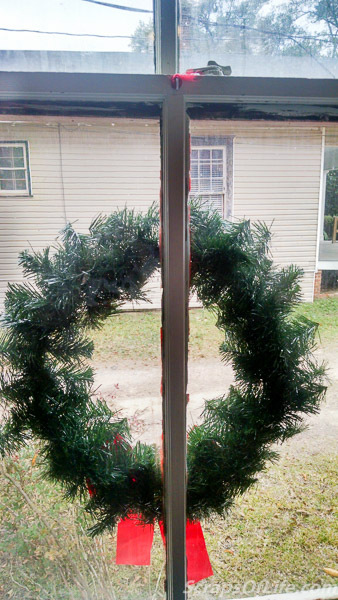 Do you decorate your windows for the holidays? This is an awesome tutorial! Super helpful. 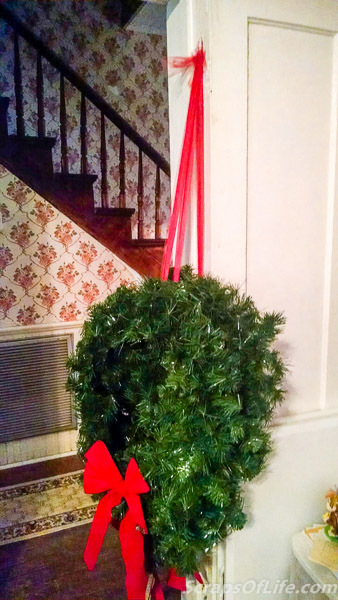 We don’t hang wreaths, but I know people will find this so useful. We.ll that is a great idea! No, we don’t decorate the windows. In fact, we are in the “decorate only the top half of the tree” phase right now with the baby. Perhaps next year! Oh, bless your heart! Most folks I know with little ones keep the soft ornaments on the bottom branches so no one gets hurt if little hands pull them. This is a genius idea! I would’ve never thought to try this. By the way, I love your house! That porch looks amazing! It’s my favorite look and I’m so glad that now we can do it, too! This is an awesome idea. Thanks for sharing the tutorial. Great ideas here I love wreaths at Christmas but definitely need help learning how to hang them. I wanted some way to make sure they didn’t blow off if we had a storm and this worked really well. I’m sure it’s adaptable to most window styles, too. What about those strong magnet hooks? It’s at least worth a try! Neat tricks for bulky decorations. Fantastic, thanks. My house is going to look amazing this year. You’re welcome, Sarah, and good luck with your decorating! I LOVE the look of wreaths on the windows!! I say every year I’m going to do this, but the idea of getting on a ladder terrifies me! This is a great tip! I hope I’ve given you a way to make it work for you, then! I wonder if you secured both the top and bottom of the wreath would it keep them stable enough? This is very clever! I must agree necessity is the mother of invention! I don’t hang wreaths on the outside of the upstairs windows – but I love the look. I might need to think about this for our home. We have the newer side to side sliding windows, So I think once the screens are removed it would be pretty easy to hang from the inside. Ok Thanks! I now officially have something else added to my to-do list. lol! Definitely give it a try, Stacey–it’s such a classic Christmas look! This is a great idea. We have never done outdoor wreaths, but I love how easy you make it look. I love your house, it’s super cute! I agree with you with the fluffingâ€¦omgoodnessâ€¦a wreath (and artificial tree) can look really pitiful when you don’t do this. 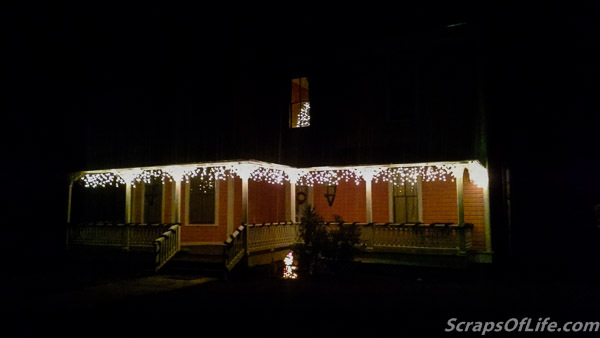 I love the icicles lights on the house â€“ they are so pretty. I JUST (probably a couple of hours ago) put out our door wreath. No window decor for us – just the door. Todd just finished putting up the lights today but I still have to get out there and put up the garland. I love wreaths! Thanks to your posts I think I will hang some on my house LOL thanks for sharing! Yay!!! I’m glad you’re going to give it a shot! Thank you. I usually see them on the stately colonial-style homes around here. I guess it’s not as much a think in the UK? We *finally* got ours hung last night–took maybe 15 minutes once we started, it just took putting it in the planner to get done.